Temporal Table is a new type of user defined table introduced in SQL Server 2016. Temporal table are tables that SQL Server automatically tracks the full history of the data changes into a separate history table. This gives you the ability to know what your data was at any point in time. Table needs to have a Primary Key. If table does not have the primary key it will raise an error. Table needs to have two DATETIME2 columns representing the start and end of the row's validity period. 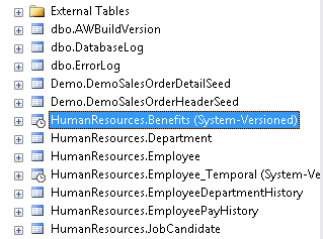 In this step we will create the Benefits table in the HumanRecoures schema and turn on versioning for a history table. What is important to remember is that the datetime2 data type must be used when creating temporal tables. In this step, we are going to insert some sample data. The sample data is the current employees elections for the year 2017. Employee number 2, only has benefits for himself in 2017. In this step, our employee #2 was married in 2017 and will change their benefits to Employee+Spouse. This will create a record in the BenefitsHistory table that will be the vaild history record for this row. After the update, a record is inserted in the BenefitsHistory table. You will notice the EndTime of the record in the BenefitsHistory table matches the Startime of the Benefits table. Step 4 - Update Data in Benefits Table, AGAIN! To continue with our example, our employee #2 has had a child and now we need to update the election to Employee + Family. This will insert a record into the history table. Again, notice the Endtime will equal the StartTime of the active record.